To welcome the brand-new 16 plate into our dealerships, we have created an infographic to show you the latest new car registration sales statistics! Find out how your favourite car manufacturers have performed over the years, where the majority of car sales come from and the most popular car colour in the infographic below! White holds top position as the most popular car colour choice in 2014 with 22.4% of new reg sales. One theory to explain this has been dubbed as the ‘Apple effect’ – referring to the minimalist colour used for our iPhones and other gadgets. This is followed closely by the colour black with 19.1% of new reg sales, the colour’s sophisticated and serious characteristics make it the second most popular choice for new cars. 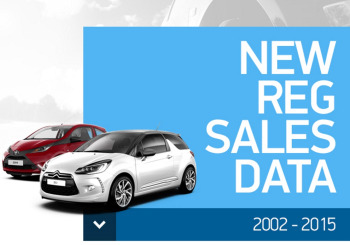 Total new reg sales have now risen to above pre-recession figures with 492,774 sold in 2015! Included in the new car rankings are the likes of the stylish DS3, Peugeot’s return of the legendary GTi badge with their 208 GTi and the Nissan Qashqai, a top contending crossover. Private sales make up the majority of the new reg sales, with most recent figures of 253,043 (2015), followed closely by fleet sales at 219,153 (2015) and the minority to business sales at 20,578 (2015). 2009 was the worst year for car sales due to the UK recession causing consumer confidence to drop to a record low, however recent economic recovery has led to sales figures reaching new heights! Our research into March registration sales data was supplied by SMMT.